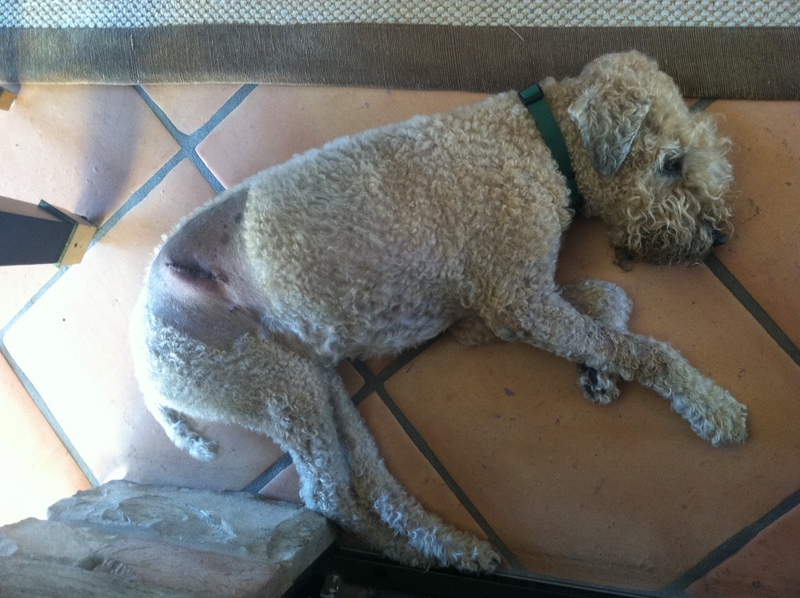 Mr. Bear, our sweet old man Wheaton Terrier had a little doggie lypo suction this week. He has had two fatty cysts for over a year and one keeps getting infected. The vet said they were having a teeth cleaning special that included anesthesia and then while he was under, they would lop off the offending lumps. I was nervous dropping him off yesterday. All I could think was “Are we being silly about this? What if he doesn’t make it through surgery? What if he doesn’t recover because of his age?”. But I trust our vet and have always appreciated her realistic approach to pet care so we kissed him and he scooted through the swinging doors. They called a few hours later and said he did great. The surgery went very smoothly and the cysts didn’t look cancerous so that’s another win. I picked him up that afternoon and they carried my old man to the car practically held together by what seemed like 1000 metal staples. He sat next to B in the backseat and she said softly “I no touch your ouchies, ok Bear Bear? Feel better Bear Bear” all the way home. After removing his cone and making him a special dinner of kibble and chicken stock, he started moving around. He is standing awkwardly which I’m praying it temporary, but he’s wagging his tail and moving around so I think he’s on the mend. I can’t believe I’m actually excited about the return of our kid toy eating, jumping on guest, rug peeing fur face. But I am. Get well soon Mr. Bear!